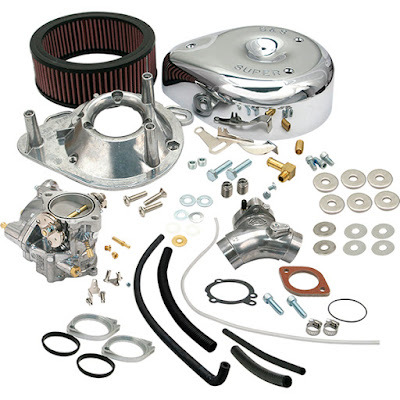 A 96” 3-5/8” Sidewinder big bore stroker kit is an “economical route to a larger displacement engine.” This kit contains nearly everything needed to take a stock 80” Evo up to 96” displacement and includes S&S 3-5/8” bore aluminum Sidewinder cylinders and forged pistons, a 4-5/8” stroke dynamically balanced S&S flywheel assembly, complete with S&S heavy duty connecting rods and main shafts, head gaskets, base gaskets, exhaust gaskets; stock cases will need to be bored out to 3 5/8”. Black or natural aluminum finish. This 3-5/8” big bore kit will increase the displacement of stock 80” Evolution Big Twin engines to 88” using the stock 4-1/4” flywheels. The kit includes S&S 3-5/8” bore cylinders, 3-5/8” bore flat topped forged pistons with rings and wristpins, head gaskets, base gaskets, exhaust gaskets and instructions. The cylinders are shorter than stock, so shorter pushrods and shorter manifold will be needed to complete the engine. Stock cases will need to be bored out to 3 5/8”. Black or natural finish. These performance replacement cylinder heads for 1984-’99 Evo Big Twins are designed to be compatible with a stock style flat topped piston. 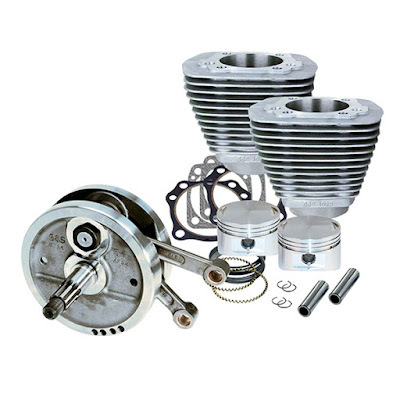 This set has a slightly larger 82 cc combustion chamber, making them ideal for larger displacement applications, producing a manageable compression ratio. 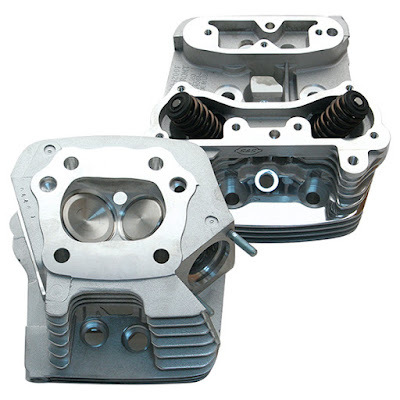 These heads are original equipment on S&S V96 and V80 engines. Larger than stock 1.900” intake and 1.575” exhaust valves provide plenty of air while maintaining port velocity for good low and mid-range response. S&S high lift valve springs allow the installation of cams with up to .585” lift. Compatible with stock intake manifolds, exhaust systems and temperature sensors for EFI equipped models. Available in black, natural or polished aluminum finishes. Replaces the stock cylinder heads. This kit contains everything needed to replace stock heads with the high flowing S&S Super Stock upgrades and optimize performance with the S&S 561 camshaft, chromoly steel adjustable pushrods and a Super E carburetor kit - complete with manifold and a high flow S&S teardrop air cleaner. 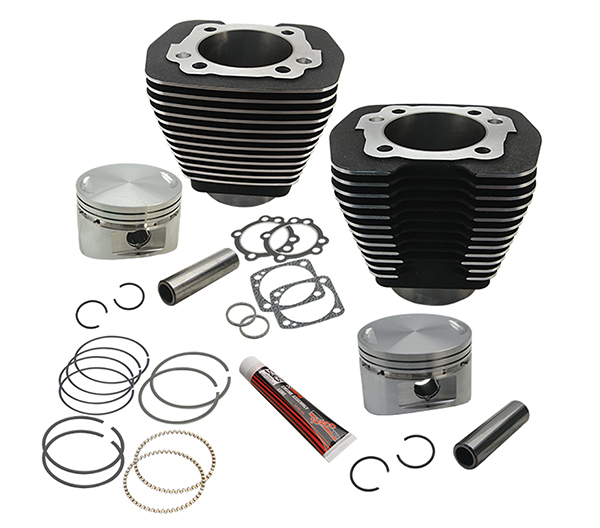 The design of the Super Stock combustion chamber requires a special separately available domed piston to yield the optimum 10.2:1 compression ratio and to optimize combustion chamber turbulence for superior flame travel. Black or natural finish. 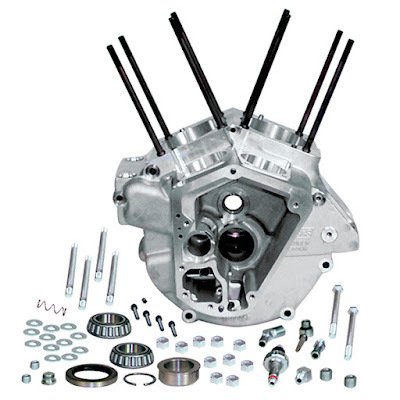 Originally designed for S&S 4-1/8 bore V-Series engines with piston oiler jets, these high volume, high pressure oil pumps also work well in stock Evo and S&S V-Series engines - they fit 1984-’91 H-D Big Twins. No thicker than a stock pump, gears with fewer but larger teeth provide increased oil volume for both supply and return sides of the pump. 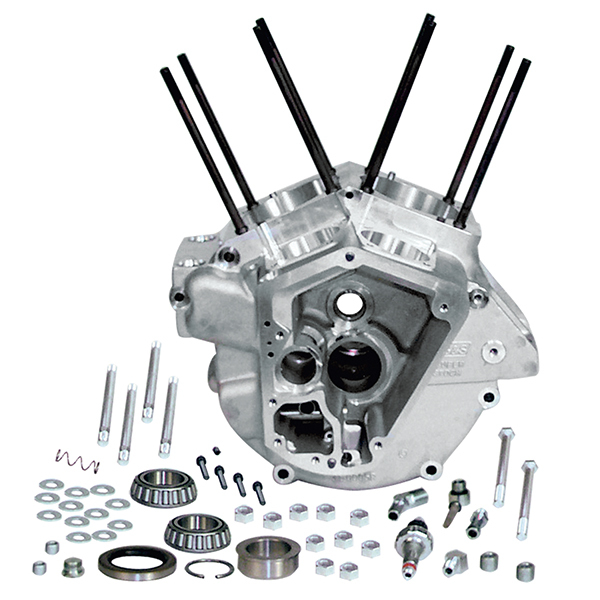 Supply gears are 9% wider than stock and standard S&S oil pumps; 28% wider than stock return gears ensure proper crankcase scavenging, reduce drag on the flywheels and eliminate oil carryover. Polished billet finish. Increased scavenging capacity results in less oil in the crankcase and less oil carryover - excess oil from the pressure control valve is filtered - and longer pump life. Equipped with a stock length oil pump drive shaft. 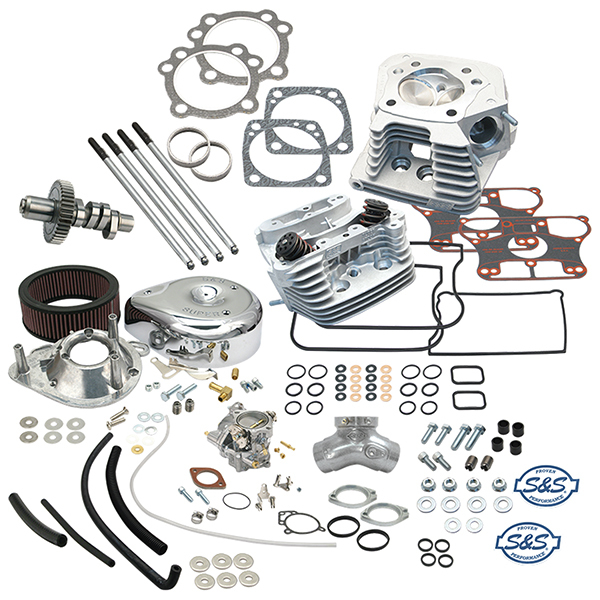 This complete S&S Super G carburetor kit contains everything needed for a complete installation on 1984-’92 Big Twins with standard tanks. 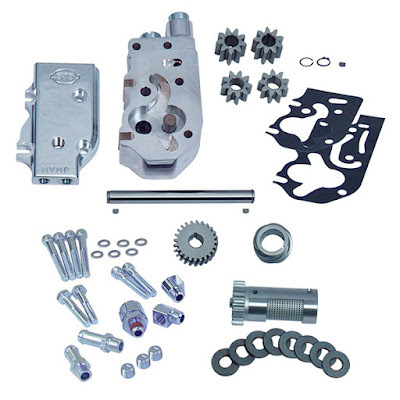 The kit also includes a manifold for engines with stock length cylinders; 2-1/16 inch bore.